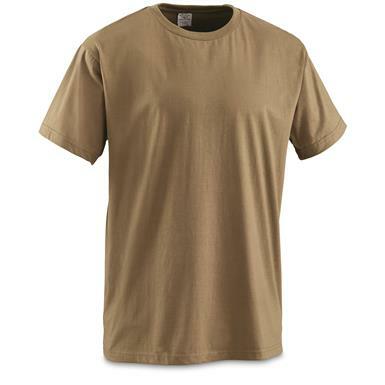 Nab 6 genuine U.S. Army Military surplus T-shirts. Moisture-wicking, 100% polyester fabric is ideal for high-activity from running to calisthenics and more. An unrestrictive fit moves with you through every bend and twist. Order your half dozen ONLINE today! U.S. Military Surplus OCP Coyote T-shirts, 6 Pack, New is rated 4.0 out of 5 by 8. Rated 5 out of 5 by Daniel from A great t-shirt I just got these yesterday so I only wore one for a day but I love it. Very comfortable and fits well. I am about 6'1" 220lb and the XL fits me perfectly. Rated 4 out of 5 by Matt1981 from Good price Really like the shirts so far. We will see what their longevity is. Rated 2 out of 5 by Chad from Soft I am 6', 205 lbs and bought the large (every shirt I own is a large). They fit more like small-choke at the neck, short at the sleeves, looks like they were vacuum sucked to my body even though the tags showed Large. Bought because they were supposed to be longer then normal shirts, they are not. Very soft, will try the XL version, I would call them a base layer shirt not a T-shirt. Rated 4 out of 5 by David from Color Off But Good Shirt Of the 6 shirts I received, only one is of a color close to coyote, the others are a shade of light green. Not like the old ACU green, closer to a light muddy green. 1 shirt has a puckered neck, the others are OK. Overall, a good purchase, I like these for biking on hot, humid days. They are indeed moisture wicking and with air moving over while pedaling, they're effective at evaporative cooling. Rated 4 out of 5 by ChrisG from Good quality...just check sizes when received T-shirts will work fine with my OCP uniform, however, I received 5 large and 1 small. Check the sizes before you go to use them. Rated 5 out of 5 by Doc1949 from Super shirt! Looks good, feels good, fits good. Super soft & great price! Rated 5 out of 5 by Oliver from True to Size, Great Value and extremely Comfortable Wow, these shirts are great! They are true to size, are very comfortable, snug, but not overly snug and I especially appreciate the length unlike store bought shirts that always seem to be short. I am 6-1, 225lbs and wear the XL.